Anyone can become a scientist in three simple steps. First, head outdoors. Second, observe nature. Third, share your findings. Congratulations! You are a citizen scientist. Lilah Monroe, a Glen Allen student, observes butterflies for a citizen scientist project. The title may not be credentialed, but professional scientists welcome data collected by citizen scientists. Naturalists, eco-friendly organizations, government agencies and land-management companies support the findings, too. Even the Smithsonian Institute and NASA rely on citizen science surveys. There is no cost or age requirement to become a citizen scientist. Participation can be on your own or with a group, such as your family. Many schools and after-school programs take part, as does Lewis Ginter Botanical Garden. 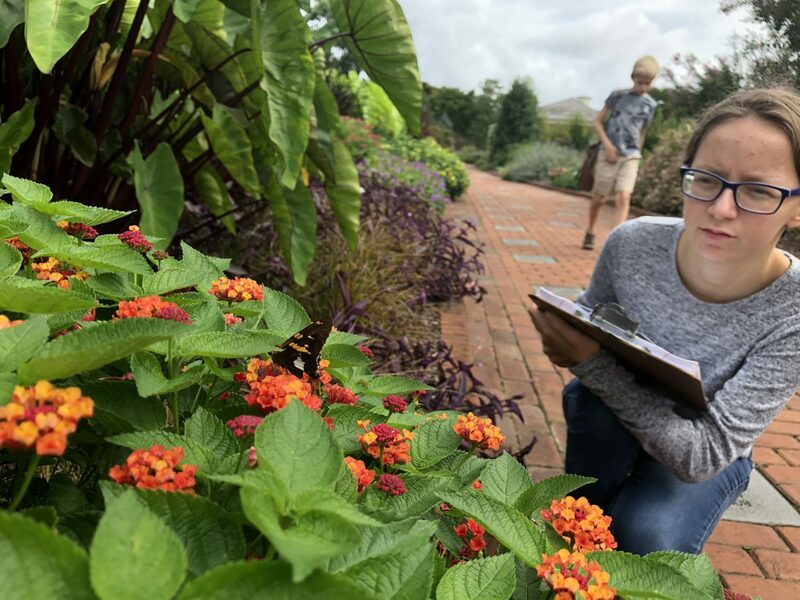 Currently, youth volunteers in Lewis Ginter’s Service Learning program help monitor and record specific observations through three initiatives: eButterfly; Community Collaborative Rain, Hail & Snow Network; and iNaturalist. In 2019, Lewis Ginter will launch Nature’s Notebook, a citizen science program, for service learning and middle school youth. Typically, a citizen science project is outlined on the organizer’s website with guidelines for specific observations and measurables. The task may be as simple as counting butterflies and measuring rainfall, or more complex, such as recording the number of invasive plants in a specified area. After observation, the citizen scientist enters findings in an e-database. Related discussions occur through online blogs and other social media networks. The benefits may be as important as the projects themselves. Online identification tools and background information teach participants about nature and the environment. Project tips hone observation skills. Ongoing posts reveal trends and demonstrate the human impact the world. Conduct an online search for citizen scientist projects and be amazed at the opportunities that await. You may make an important scientific discovery. “You’ll even relax as you soak in the natural world,” Wright said. This article first appeared in the Richmond Times-Dispatch in October 2018.